Apple Card...good enough to eat. This Apple Card is a fun idea for your children to make that they would enjoy giving to their teacher at the end of the school term. This card would be a lovely way for the kids to say "Thank You" to a favourite teacher, at the end of term. 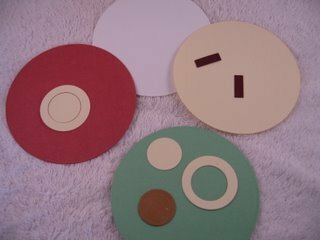 It is not difficult to make and only needs some punched or die cut circles, so why not let them have a go at making their own. 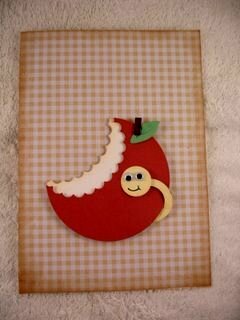 There are lots of other ideas in the Novelty Card section, which are also easy for children to do. 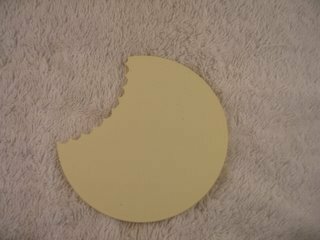 I have also cut some white and cream card for the core part of the apple. Cut two small pieces of brown card to represent the stalk. 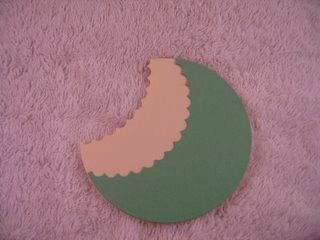 Cut a circle of cream card and then punch out the center, but keep both parts, as this will be your worm. The smaller brown circle is for the leaf, if you don't have a punch in that shape. The white or cream card is going to form the inner core of your apple. 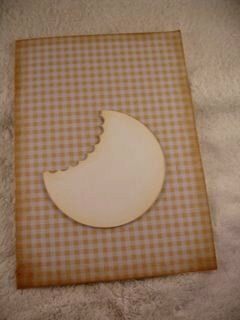 In this you will need to draw some bite marks and cut them out with your craft knife or scissors. The coloured circle will also need the bite marks. This needs to be a bigger bite than the other, so that the core will show through. So to assemble the Apple Card....add your backing paper to the base and ink the edges with your Blending Tool. Ink the edges of all the parts to the apple too, and with foam pads position the core where you want it to be. Place the colored part of the apple on top of the core. I raised mine up from the base with 1mm foam pads. The leaf shape, or the half circle of brown card, is added to the top and the stalk is placed alongside it. In the outer part of the cream ring make a small slit and slip it behind your apple. This is the worms neck. Add the inner part to the neck and this is the worms head. I drew in a smiley mouth with black pen and added some Googly Eyes. I used the computer to generate a sentiment and printed it onto some patterned paper. Cut it out and layer it onto colored card and add to the front with foam pads. Some ribbon and a few flat back pearls and it's good enough to eat....er! I mean give!! 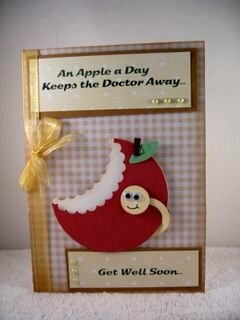 Whatever your favorite apple is, this fun Apple Card is sure to make some one smile when they receive it. And I am sure the children will have as much fun making it too.